Well, there are pretty much the same as we wish we could get. Oops, don’t take it as a false positive. You can get 2,000% more free cloud storage space in Dropbox, yes my friend it is 2k % and I aint wrong. Dropbox has been the most popular storing and sharing cloud apps since it was launched back in 2007. By then, there have been many competitors of Dropbox on the market. Ensure you have read this article Increase your Dropbox storage space upto 16GB for free from TechSansar.com where you’ll get idea to get maximum of 18 GB of free storage on Dropbox. Okay, first let’s explore how to get your first 18 GB of free cloud storage with Dropbox referrals and tricks as suggested by Dropbox officially. By now, you must have completed all of these 7 steps of getting tarted with Dropbox. Now, learn to invite or refer your friends on their university email addresses. Populate and share your referral links everywhere possible (NO SPAMMING at all) and tell people about features of Dropbox they might be interested in. Optionally, track your individual Dropbox referal links or customize via URL shortening services like Bit.ly. Share the links in your Social networks, or even can put as your personal link in your profile besides sharing. 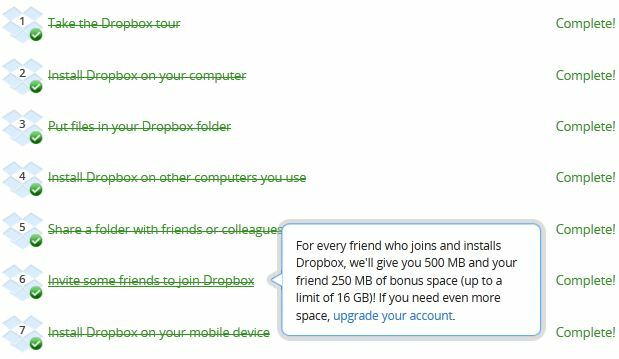 On the official Dropbox page: How much do I earn bonus space for referring friends to Dropbox? What is the maximum limit of storage in Dropbox? Okay, How much free referral space can I earn? 8 GB for a standard user, 16 GB for a student, and 32 for a Dropbox pro account. But, still to come, I’m just a normal Dropbox user and I have 42 GB of free storage. How to get 42 GB free storage on Dropbox? In fact, on this section, I’m going to write about getting 23 GB of bonus space with Dropbox as a courtesy for HTC devices (Don’t worry you can earn this space even without having any HTC Device). So, add up this 23 GB with previous storage earned of 18 GB which gives you 41GB for now. Step 3. Install Dropbox app from this apk file as usual. Supply your Dropbox associated email. Step 4. Wait for a confirmation email from Dropbox “Dropbox bonus space received!” as shown below. Enjoy. Now you have earned 23 GB additional storage for 24 months as a courtesy of HTC.